INDEPENDENCE, Ohio (AP) — Cavaliers coach Tyronn Lue isn’t changing his starting lineup or rotations despite Cleveland’s current troubling state. 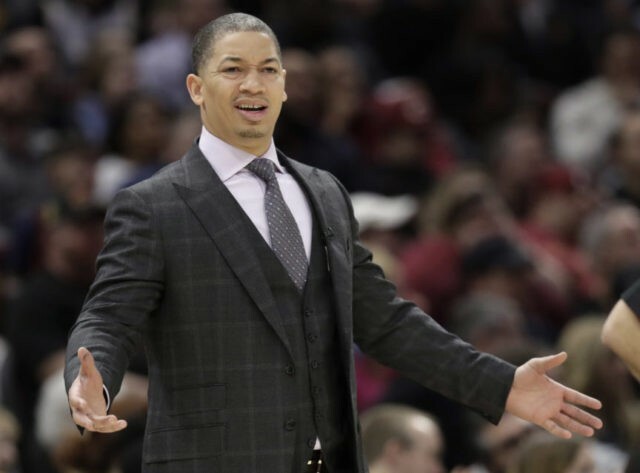 A day after the Cavs gave up 148 points — tying a franchise record that stood since 1972 — in an embarrassing loss to Oklahoma City, Lue said he’s not making any major moves to snap his team from its mid-season doldrums. The Cavs have lost 10 of 14 and have been blown out three times in the past week. Lue decided not to show his players video on Sunday as the team practiced in advance of Tuesday’s game in San Antonio. Lue explained his reasoning for not making any changes as the Cavs are the same team that won 13 straight and 18 of 19 earlier this season.